Dr Katrina McFerran is a registered music therapist, researcher and lecturer who specialises in supporting young people to develop healthy relationships with music that promote personal growth and increased connectedness. Dr Kat has been involved in a range of mutually empowering relationships with teenagers and children in hospitals, schools and community programs. She has used music to support people as they cope with grief and loss, illness, disability and a range of challenges both at school and at home. Her work is currently focused on building strong music cultures in schools that promote connectedness and wellbeing between students, teachers and systems. 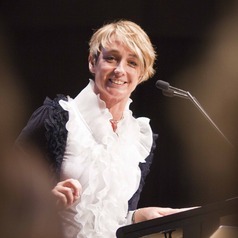 Dr McFerran has published her research in international and interdisciplinary refereed journals and has contributed numerous case studies and practice reflections to edited books, as well as authoring the first text on ‘Adolescents, Music and Music Therapy in 2010 (Jessica Kingsley Publishers), and co-authoring an innovative text on 'Building Healthy Music Cultures in the Schools' (2015, Barcelona Publishers). Her research is essentially reflexive, frequently using qualitative methodologies to explore the unique experiences of young people in music therapy or to investigate patterns in the ways that music is appropriated for health. Dr McFerran has also contributed to a number of studies using quantitative methodologies that provide evidence for the benefits of music therapy. She coordinates two breadth subjects that explore the affordances of music for health and wellbeing from different paradigms – Music Psychology and Music & Health.